With more than 1,000 varieties of acacia worldwide, the majority of acacia wood imported into the United States originates from two species: Acacia koa -- also known as Hawaiian koa -- and Acacia blackwood. Supplies of Hawaiian koa are dwindling due to slow tree growth and attrition. Both species are accurately defined as part of the Acacia genus, which also includes shrubs and plants, but are more commonly referred to as simply koa or Australian blackwood. A seed pod dangling from an Acacia koa tree. 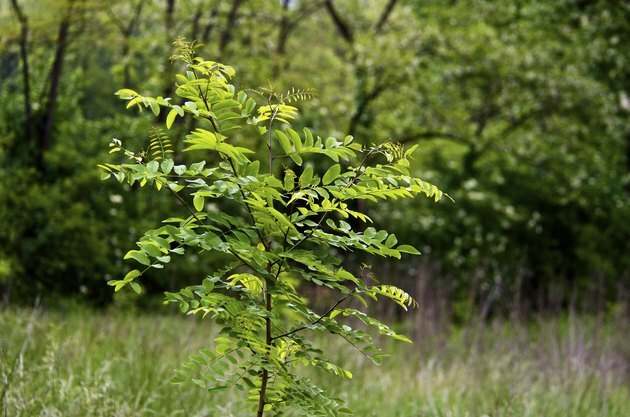 A young locust tree growing in a spring meadow. Acacia is a hardwood harvested from trees 60 to 100 feet in height native to Australia and Hawaii. It also grows as thorny shrubbery in temperate and tropical climates. 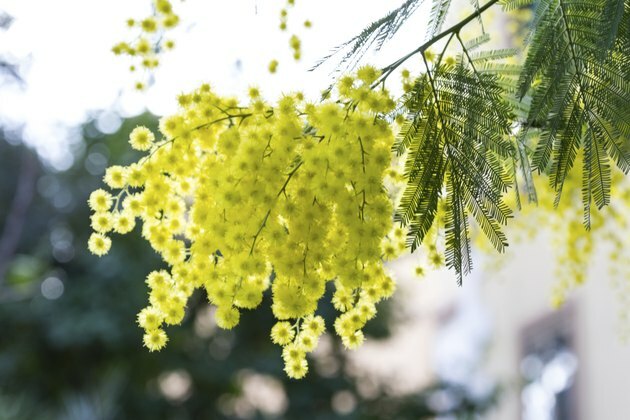 Smaller varieties of acacia are typically not used as lumber sources. Hawaiian koa is the premium species of acacia for woodworking. It contains high amounts of figured grain and produces a high-gloss sheen after finishing. Koa is more expensive than Australian blackwood, which is typically considered a lower-cost alternative to Hawaiian koa. 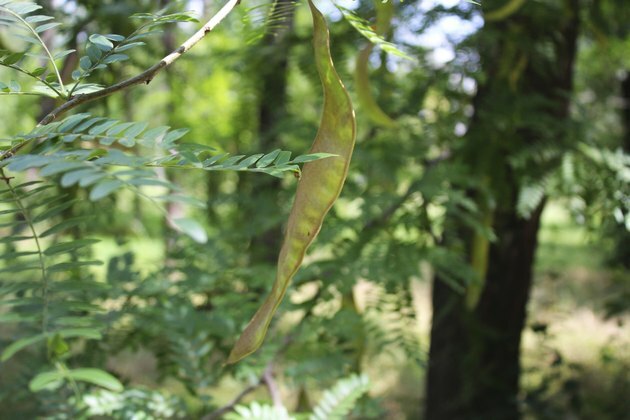 A domestic species -- locust -- is similar in characteristics to koa and Australian blackwood and is sometimes referred to as false acacia, but do not confuse it with authentic acacia. 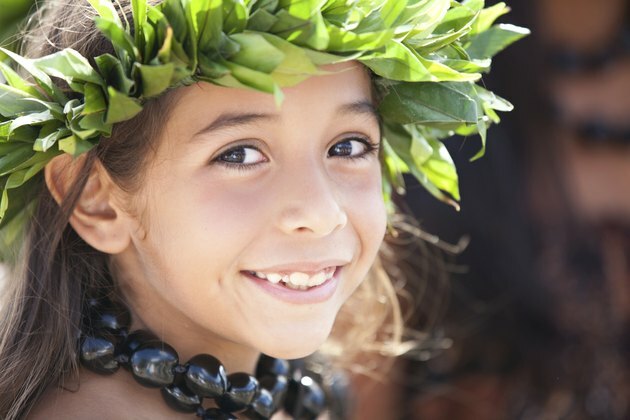 A young girl wearing a headdress made from Hawaiian koa leaves. Hawaiian koa ranks 1,790 on the Janka hardness scale. For the sake of comparison, maple, one of the hardest domestic varieties, ranks 1,450. Considered easy to mill and carve with ordinary woodworking machinery, koa exhibits characteristics similar to domestic black walnut. It mostly presents broad-grain patterns with open pores, but because of intermittent, interlocked grain patterns -- grain that undulates or turns at 90 degrees -- it can suffer from blow-out or chipping when milled. The color of Hawaiian koa is varied, but retains patterns similar to mahogany with gold, amber and reddish-brown tinting. It is not uncommon for koa to display colors intermixed in a ribbon formation. The curly, interlocked grain patterns that cause problems during milling add character -- and when sanded -- display a finish prized by specialty woodworkers. Hand-selected, highly-figured koa boards command high prices. Koa is non-resistant to decay and bugs, and not appropriate for exterior use without a sealant. Yellow flowers blooming on the branch of an Australian blackwood. Australian blackwood is increasingly used as a substitute for koa, but the descriptor is somewhat misleading. The color of Australian blackwood ranges from gold to reddish brown, and is very similar in color to mahogany or Hawaiian koa. On the Janka scale, Australian blackwood ranks slightly lower than koa at 1,160, and tends to have straighter grain and better machining characteristics than koa, with fewer interlocked grain patterns that chip or blow-out. Australian blackwood exhibits higher decay resistance than koa, but remains susceptible to insect attack. Blackwood is not appropriate for outdoor use without a sealant. Both koa and Australian blackwood are known as sensitizers, which causes irritation to eyes and skin when cut or during milling. A close-up of a eukelele made from acacia wood. Australian blackwood and koa are interchangeable for use as veneer, fine furniture, cabinetry, gunstocks, canoes and musical instruments. Koa is sought out more often for specialty projects such as figurines, bowls, plaques and carvings. Koa is more figured, and typically finishes to a higher polish than Australian blackwood. 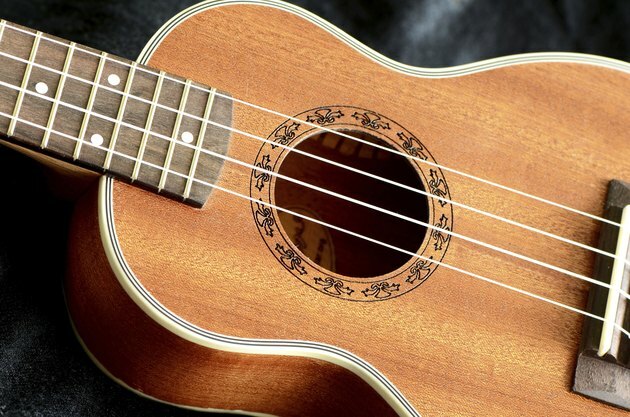 Some musical instrument manufacturing firms use a combination of rosewood, mahogany or spruce to build guitars, mixing them for the best sound and appearance -- acacia has all these characters combined. It produces the warmth of rosewood, the resonance of mahogany or spruce, and has the flame and figure that make acacia guitars some of the best in the world.